On my way to work the other day, I saw something that made me feel heavy. What I saw might just be okay for others, but, I am not those “others” so I’ll say it’s not okay. Forgive me for what you are about to read, or for even thinking for a second that I should post it here. I just need to ventilate! That’s all. For the record, I don’t even like cats! But, I really feel sad for the poor animal. What if somebody owns (or used-to-own) it? What if the owner is going crazy looking for it only to find out it’s already dead? That’d be so sooo sad! I can’t imagine how I’d feel if ever this happens to my Yuki (the super dog). Oh Noooooo! Maybe that cat was loved and spoiled by its owner too. Maybe the cat just happened to sneak out their house and ended feeling so scared waiting for its chance to cross the road safely. Then suddenly, some bad, no, super bad driver didn’t even bother to look that a cat is crossing the road! Ohhh…dead kitty! On the road! *Smack me now if I’m starting to get annoying. * I'd like to think it's an angel now...yeah, with wings! I don’t like cats. (Yeah, I said that already.) But my bestfriend does! When we were young, she always (!) adopts those cute little kittens we find roaming around. For her, they’re too cute to just be left alone in the dangerous roads. Then, her mother would always scold her for bringing them home. She doesn’t mind the sermon though. Those cats deserve a home, yes. However, it’s not the same for me. My mother neither loves cats---and---I have bad experiences with them to begin with---the very reason why I don’t like them. Their paw-nails are very sharp and I’ve proven that for the nth(!) time. The last one was when I tried to cuddle this little kitten of our neighbor, showed it to Yuki, and ended up being deeply scratched. (so it’s not just a scratch then, huh!) But, those bad experiences don’t mean I no longer have a heart for them; hence, this post! All I can hope now for the poor cat is for its soul to be in peace. 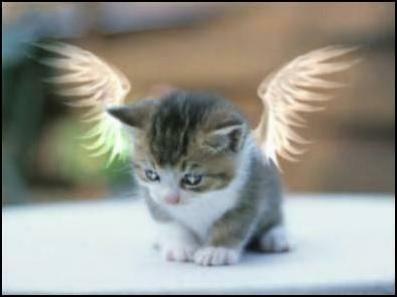 If there is a heaven for cats, may it go straight there and may it just forget how it painfully died.